Emily Winifred Dickson was born in Dungannon, Tyrone, in 1866, the daughter of the Ulster Liberal MP Thomas A. Dickson and his wife Elizabeth Greer McGeagh. Winifred was the second youngest of seven children and was educated at the Ladies Collegiate School in Belfast and Harold House School in London. After nursing her sick mother for a year and with the encouragement of her father, she decided to pursue a medical education. Winifred initially attempted to follow her brother and enrol at Trinity College Dublin for 1887-88. Trinity College was not at this time open to women students, however. Although Dickson was supported by the medical faculty, her application was opposed by the theologians of the university. As a result, she enrolled in the Royal College of Surgeons in Ireland at the age of twenty-one in 1887, where she was the only female student. An extremely bright student, Dickson won several prestigious medals. She gained her clinical experience at Sir Patrick Dun’s Hospital, the Rotunda Lying-In Hospital and the Richmond Lunatic Asylum and in 1891 qualified with the licence of the Royal Colleges of Physician & Surgeons (LRCP&SI). In 1893, she took a medical degree at the RUI (MB BCh BAO), achieving first-class honours and an exhibition. 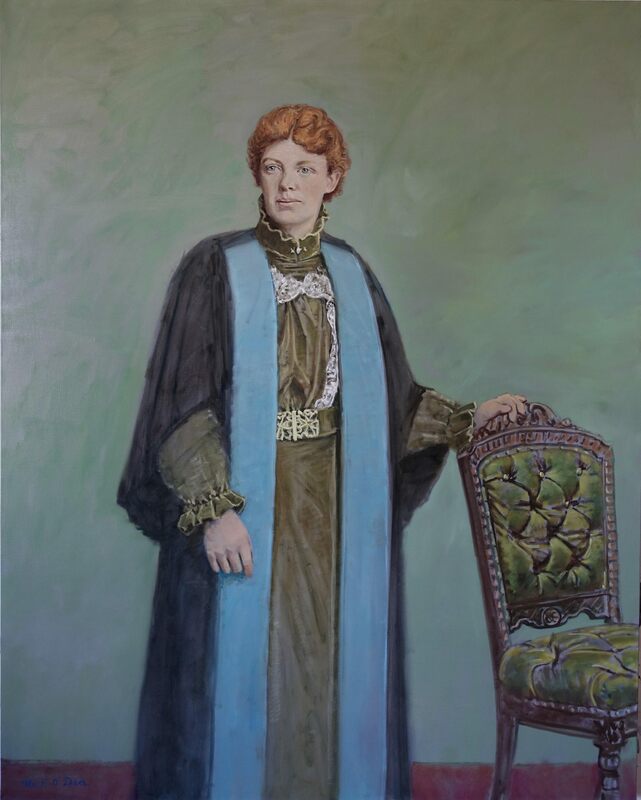 Dickson attained by examination the Fellowship of RCSI and thus became the first female Fellow of the Royal College of Surgeons in Ireland in 1893. On a scholarship from the Royal University of Ireland in Vienna and Berlin, Dickson found herself unable to gain admission to many of the clinics. Upon her return to Dublin in 1894, Dickson put up her plate first in her father’s house in St Stephen’s Green. In 1895, after he moved to Drogheda, she moved practice to 18 Upper Merrion Street in Dublin and was appointed gynaecologist to the Richmond, Whitworth and Hardwick Hospital, where she worked for four years. A photograph taken of the medical staff at the Richmond Hospital during Dickson’s time there shows an all-male staff with the exception of Dickson. She was also appointed assistant master to the Coombe Lying-In Hospital, Dublin, for which she became supernumerary assistant in 1894. Dickson took a doctorate in medicine at the RUI in 1896, as well as the degree of master in obstetrics, both with honours. She was then appointed examiner in midwifery to the Royal College of Surgeons in Ireland. In 1898, she applied unsuccessfully for the position of professor of obstetrics there. Dickson’s early career was supported by the Irish medical profession, as the number of letters of recommendation from her former lecturers attests. Dickson was one of a very small group of pioneer women doctors in Dublin in the 1890s. By 1911, there were forty-two female medical practitioners in Dublin. Many of these doctors were interested in philanthropy and Dickson was no exception. In her early career, she was strikingly active within the public sphere and her activities were widely reported in the Irish press. In 1893, the year she graduated MD, she gave a lecture on ‘Health and dress’ at a meeting of the Dublin Health Society, which was published. While studying in Vienna in 1894, Dickson wrote to the British Medical Journal about the treatment of women patients in workhouses, arguing that women patients with gynaecological problems preferred to be treated by women doctors and so there was a need for women as workhouse doctors. She attended, participated and presented at meetings of the Royal Academy of Medicine in Ireland. At a meeting of the Irish Suffrage Association in Dublin in 1895, she urged ‘the necessity of well-to-do women taking an interest in questions which affected working women’. She was also involved in the National Society for the Prevention of Cruelty to Children and the Irish Association for the Prevention of Intemperance. In 1895, at a meeting in Dublin of the Royal Academy of Medicine in Ireland, she gave a paper, subsequently published, on the need for women as Poor Law guardians in Ireland, with all of her male colleagues present supporting her views., Dickson commented in a letter of 1942 that women’s emancipation was the only worldwide movement she took an interest in, although she was insistent that she did not agree with militant suffrage. She was interested in the rights of women within the medical profession. Her obituary claims that it was her correspondence with the secretary of the British Medical Association which helped to open its membership to women, with Dickson becoming one of its first women members in 1892. Additionally, Dickson was supportive of young women medical students and was the honorary secretary of a committee in Dublin set up to advise women students on their work and finding suitable lodgings. Dickson married Robert Martin, an accountant, in 1899. She gave up her career on marriage and had five children, four boys, Russell, Kenneth, Alan and Colin, and one girl, Elizabeth (‘Betty’), between 1901 and 1910. The family remained in Dublin and in 1911 were living at 8 Burlington Road. Winifred was listed as ‘Medical Doctor Retired’, while her husband, Robert, was now a managing director for a textile manufacturer. The family then moved to Castlewarden, Co. Kildare, where they lived from 1912 to 1913. Dickson appears to have withdrawn completely from medical society. Robert Martin enlisted in the British Army in London in 1914 and was posted as a private to Mansfield, Nottinghamshire and later to Burma from 1917 to 1919. He allocated to Winifred 6d per day (just over £9 a year) from his pay. She decided to return to work to supplement this income. Winifred Dickson effectually became the sole breadwinner for the family. She and her family moved to England in 1915 and she sent her children to the English preparatory and public boarding schools, Mostyn House, Cheshire, and St Bees in Cumberland. She secured a post as assistant superintendent at Rainhill Mental Hospital in northern England, which she chose as the hospital was close to her children’s boarding school, and the off duty hours enabled her to study to return to the practice of medicine after sixteen years’ absence. I don’t regret anything, even the foolish things, but I see in countless ways that I missed many priceless chances and opportunities, not from wilfulness but from sheer blind stupidity of not appreciating how much they might mean and lots of things I thought I knew all about and didn’t know there were worlds unknown that I was unaware existed. Winifred Dickson died at the age of seventy-seven in 1944 from an incurable carcinoma. Strong-minded and unselfish as she had been throughout her life, she made no mention of her diagnosis to her family but continued with her work to within weeks of her death.